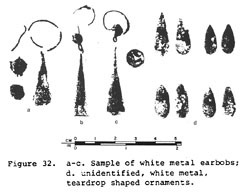 "Several of the Indians' fighting techniques were calculated to strike terror. Some warriors entered battle naked except of for a loin cloth, but their bodies were streaked with bizarre symbols in red and black paint. Other fighters wore battle costumes ranging from captured military uniforms to their traditional finery of feathers and medallions beaten from silver coins. Especially effective was the war cry, shrieked each time a shot was fired, which began like a growl and ended with a shrill yelp. The best rendition that any contemporaries could give in print was "Yohoehee," which does not create the crawling of the skin that the soldiers felt who heard it first hand. (1880) "Having no pockets, the Seminole is obliged to submit to several inconveniences; for instance, he wears his handkerchief about his neck. I have seen as many as six, even eight, handkerchiefs tied around his throat, their knotted ends pendant over his breast; as a rule, they are bright red and yellow things, of whose possession and number he is quite proud. Having no pockets, the Seminole, only here and there one excepted, carries whatever money he obtains from time to time in a knotted corner of one or more of his handkerchiefs." 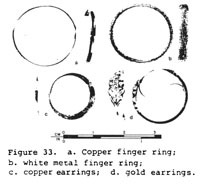 "Nor is the wearing of finger rings more common than that of rings for the ears. The finger rings I saw were all made of silver and showed good workmanship. Most of them were made with large elliptical tablets on them, extending from knuckle to knuckle. These also were home-made." "They also wear a watch chain and numerous safety pins fastened to their shirts. but I have never yet see one carry a watch...."
"Bracelets are another form that is quite rare; only on ceremonial occasions are those that are left worn. They are usually an inch to an inch and a half wide and are quite thin. 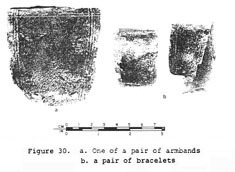 At each end is a small perforation and a buckskin thong is run through to hold the bracelet in place." 1940 "Silver Work of the Florida Seminole." E1 Palacio 47:25-32. 1967 "Billy Bowlegs (Holata Micco) in the Seminole Wars." Florida Historical Quarterly 45: 219-42.